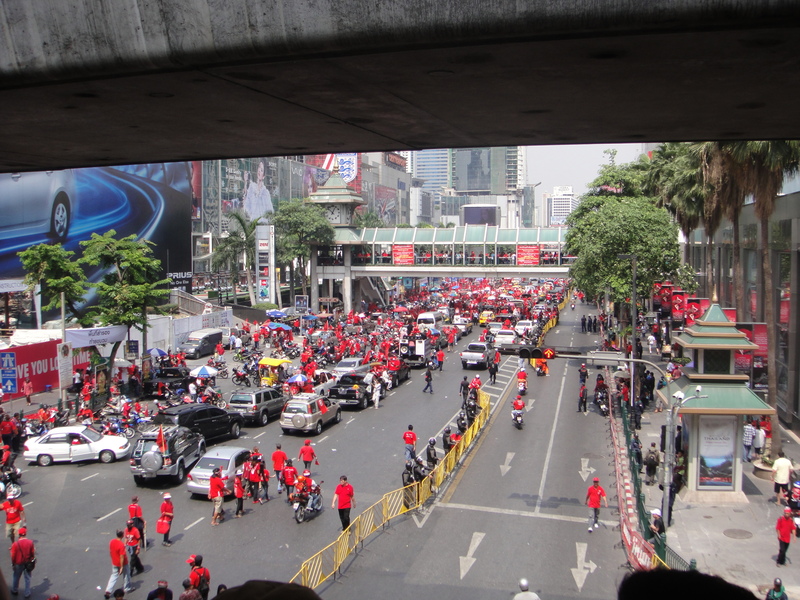 The red shirts returned to Ratchaprasong today, I live only a ten minute walk away. After having my street closed to traffic and all activity for over 2 weeks last year by the red shirts protest, I cannot say it was a welcome return. They promised a big protest, I went to have a look. It was a good turn out, maybe 6,000. They partied and played their music, then caravanned away to block traffic and visit other parts of the city. A very odd twist to today’s protest at Ratchaprasong, yesterday was Makha Bucha, an important Buddhist holiday that marks the first sermon by the Buddha to his disciples. Directly across from the protest site there was a large celebration at Erawan Shrine with many monks for the Makha Bucha holiday. More on that in another post. Protests in Bangkok are not like the protests that are happening in the Middle East, these are more like rallies and parades. The atmosphere is more party like than protest like. As you watch and read about the passion and commitment of the protests in the Middle East and compare that with what is taking place in Bangkok, it isn’t fair to even call what happens here protests. 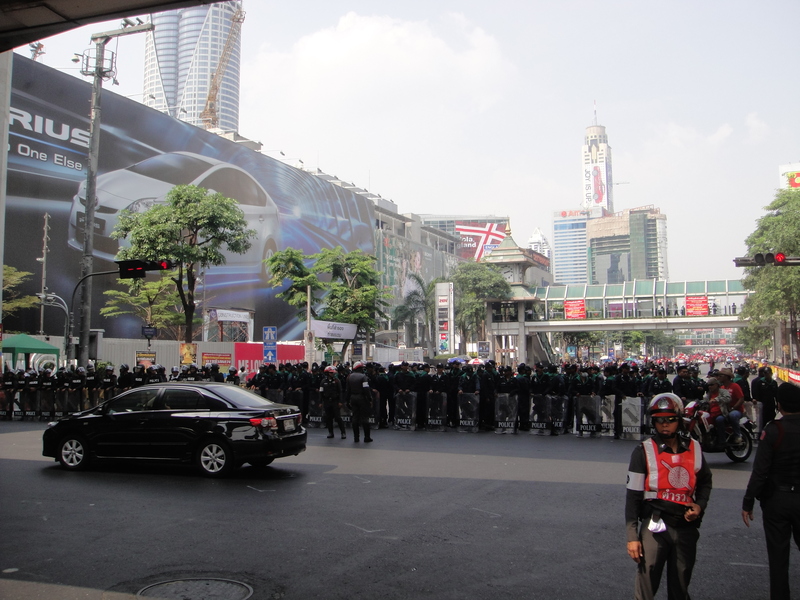 The Thai government provides police for the protests, both to keep the protesters in line and protect the protestors. This is not at all like the battles you see raging in Bahrain and Libya where protestors are dying for the cause. In fact, some leaders of the red shirt protest were dawning wigs and fleeing the 2010 red shirt protest as the government closed in. Police blocking the road for the red shirts "protest"
I am not anti red shirt, but when you continue to meet and protest and it goes nowhere, stop. The protest in Egypt took down the government in 18 days, what is being accomplished with protest after protest in Bangkok, other than hurting the image of Thailand and scaring off investment and tourism in Thailand? This entry was posted in Bangkok, Culture, Politics and tagged 2011, Bangkok, Bangkok protest, Bangkok Protests 2011, Buddhism, current events, February 19, is bangkok safe, Red Shirt March, Red Shirt Protest, red shirts, Red Shirts in Bangkok, Red Shirts Protest, Thailand, Thailand Politics, travel to Bangkok now. Bookmark the permalink. chanced upon your blog, and saw that you lived in bangkok. I was thinking of planning a trip over to bangkok this march 2011. Is it safe to travel to bangkok now? If there is protest, will shopping malls or markets like pratunum, chatuchuk be closed? Yes, I continue to feel that Bangkok is safe. At no time during the protests has Chatachuk been closed- much of Pratunum was closed in 2010 as it is very close to Ratchaprasong. The current red shirt protests at Ratchaprasong have been taking place for one day- really one afternoon and usually on a Saturday or Sunday afternoon and only once per month. This is something of a concession by the red shirts as the merchants around Ratchaprasong have met/complained about the loss of business during the protests. Most stores stay open if the protest is temporary- the stores have been staying open in 2011. It is safe to visit, I have gone to the protests this year. As a protest, they are boring. As a party and parade, they are good. All protests are very well publicized and could be avoided (or at least they have been to this point). I have lived in Bangkok for 14 months and traveled here for over 10 years, I have never had any issue with personal safety. thx for the info..very helpful…indeed those protests are affecting tourism in bangkok, tourists becomes more cautious when planning a trip there… just like me =) but still i feel it’s a nice place with nice food, tom yum goong!